Look out at the Toronto skyline today and a city of skyscrapers stares back at you. Like trees in a jungle, reaching ever further skyward, seeking to eclipse their neighbours. With a characteristic sense of modernity defining Toronto’s skyline, it’s sometimes difficult to remember what it was like when the first skyscrapers began cropping up in our fair city. Today, there are very clear definitions over what constitutes a low-rise building, a skyscraper, a supertall building, and so on. But this wasn’t always the case. In the late 19th century, there were a series of architectural and engineering developments that made the construction of tall buildings a reality. Given the fledgling nature of the field, definitions for the different types of tall buildings were fluid. Typically, steel frames and the inclusion of an electric elevator were the key components differentiating a skyscraper from other buildings. Given the broadness of this definition, there is naturally some debate over what was Toronto’s first official skyscraper. Some consider the first skyscraper in Toronto to be the 1892 Board of Trade Building. Built at the corner of Front St. East and Yonge St., this seven-storey tower was home to the Toronto Board of Trade and Toronto Railway Company (a privately owned company that would later become the publicly owned Toronto Transit Commission). Tall buildings were quite new at this point in time and posed significant architectural challenges. 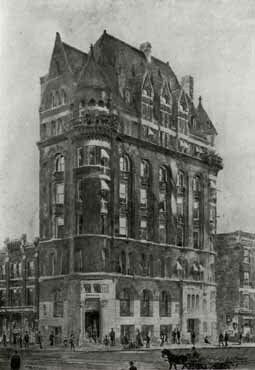 The original design for the building, by the New York architectural firm James & James, partially collapsed during construction. The firm was subsequently dismissed and Edward A. Kent from Buffalo was hired to finish construction. The building was demolished in 1958. In 1894, locally popular architect E.J. Lennox designed the seven-storey tall Beard Building for the corner of King and Jarvis streets. It was originally planned as a nine-storey building with an iron skeleton, but was actually constructed using conventional wood. This had lead to some disagreement over whether the Beard Building actually constitutes a skyscraper, as some early definitions required “a multi-storey building constructed on a steel skeleton.” The lack of a steel frame was only discovered during the building’s demolition in the 1930s. Lennox’s Beard Building was surpassed in height only two years later by the Romanesque Revival styled Temple Building. Erected in 1896, the Temple Building stood just over 121 ft. tall at the corner of Richmond St. West and Bay Street. This 12-storey structure, designed by Canadian architect George W. Gouinlock, was home to the Independent Order of Foresters (now simply known as Foresters). As this was early in the skyscraper game, the Temple Building was built around a cast-iron frame. In the near future, steel frames would become the standard, but Gouinlock was working with what knowledge was available at the time. Upon completion, it was the tallest building in Toronto and retained that title for nearly a decade. In 1970, the building was demolished in favour of the Queen-Bay Centre, but a portion of the Temple Building’s façade can be found on the grounds of the Guild Inn. 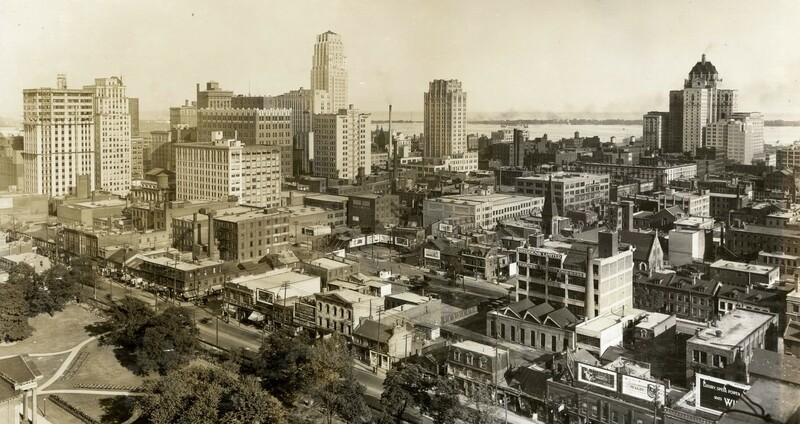 In 1905, a new century of skyscraper construction began in Toronto. The Trader’s Bank Building, a 15-storey tall building at 67 Yonge St., was the tallest building in the British Commonwealth at the time. It was designed and completed by the Beaux-Arts New York architecture firm Carrère and Hastings in 1906 and held the title of tallest building in the British Commonwealth until 1913. A distinctive feature at the time was that near the top of the building, a cornice projects outwards and obscures the top floors from view at the ground level. This feature made the building look shorter and exert a less dominating effect on the street below. A relatively new practice in the early 20th century, setting the top floors of large buildings back from the base has become a common practice. The Trader’s Bank Building was the first building in Canada to exceed 12 storeys and stands today as Toronto’s oldest surviving skyscraper. Today, skyscrapers are being dwarfed by a new generation of towers that are supertall (over 300m) and megatall (over 600m). Though these few examples of early skyscrapers are quite modest when compared to the heights today’s building regularly reach, they helped to usher in an era of rapid skyscraper development. The architectural and engineering feats accomplished at the turn of the century have culminated in projects like the Burj Khalifa, the Shard and Mirvish+Gehry. Click HERE to sign up for our newsletter and stay updated on news, events and all things Mirvish+Gehry.